Just this last week a customer asked me to come out and install two ethernet runs and two phone line runs. I went out to their newly constructed office and was rather shocked by what I found. While the office was quite beautiful it was a complete failure in terms of design. All modern construction should take low voltage applications into consideration before you start building. Low voltage runs for networking, telecommunications, and video services should be shown on the blueprints. All three types should be home run to a telecom closet or box in a utility room. Typically this will be the same location as your office or home's fuse box. If cabling won't be pulled at the time of construction boxes and conduit should be installed for future upgrades reducing the effort and cost to install this wiring in the future. Installing Phone, Internet, and TV then entail only putting a providers box in the closet and connecting two or three cables. This should take no more than 20 minutes and no tools other than possibly a wrench for the coax connectors. Reasons for this are to ensure that if you want a flat panel tv mounted to the wall both it's power and TV signal are located behind it resulting in a clean looking install. You don't want a brand new office or home with a nice wall mounted TV and a shower of cabling hanging under it. The office I was called to service had just been built. The drywall was up and about to be painted. No consideration was paid for low voltage systems. This was the first failing. The second was when Comcast had come in to install TV, Internet, and their business phone system. First off the Comcast installer set up two cable jacks. One on the wall for a wall mounted TV, and another under a desk for the cable modem and phone equipment. Neither was properly installed from a mechanical standpoint. A proper low voltage install in an existing building uses what is called a "low-voltage ring" installed in the dry wall. This prevents any damage to the wall while pulling cables and provides a secure place to attach the finished connection plate. Without this ring the plate can pull out of the wall or sit oddly. Here is a photo of the work Comcast provided. 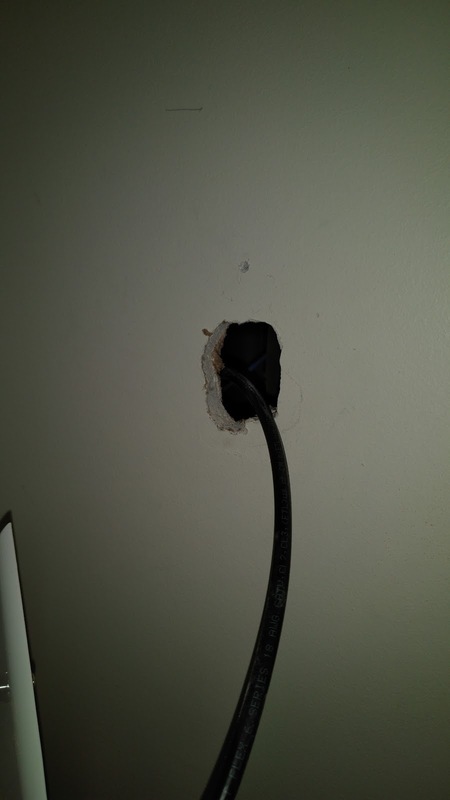 As you can see the installer just drilled a few holes in the wall and pulled the cable through, then installed the plate with the improper screw to the drywall. This would have pulled out of the wall without effort. The customer told me that the install took 10 hours. I spent 6 hours pulling the requested lines and corrected the above install with the low voltage ring and a multi connection plate to make the install look finished. Here is my workmanship. 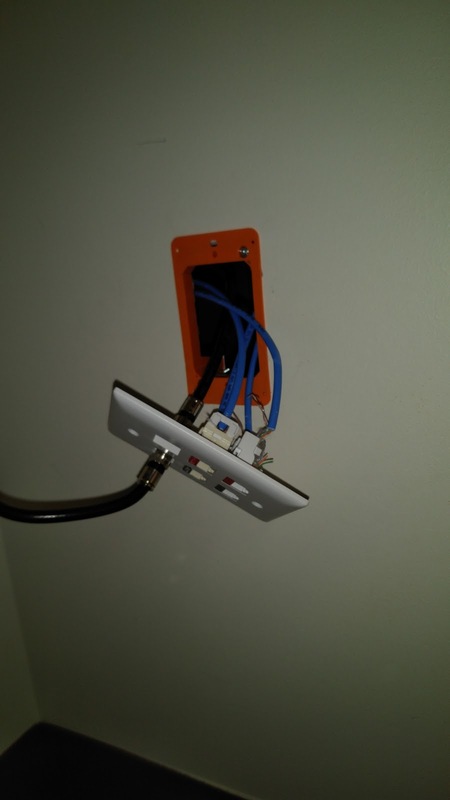 The orange piece in the wall is the low voltage ring. To install this I had to make the hole larger. Large enough I could get my hand easily into the wall to grab wiring. By spending 10 minutes correcting this I saved the customer at least 2 hours of work. In all honesty though if this office had taken low voltage into consideration before mounting drywall I could have wired the whole office for Network, Phone, and TV in the same period of time instead of fighting pulling cabling through drywall and insulation. The wall mounted TV would have been done and the Electrician would not need to return. The Comcast installer would have only had to drop a modem on a shelf in the back room and clicked a few cables into place. If you're building a new home or office take these topics into consideration. If you're looking at an existing office space make sure to check that these things were thought of. Even if an older office wouldn't have TV or network considerations there is no excuse for any office built since the 1970's to have no considerations taken for telephone. These are considerations not only for those looking for a home or office property, but for those looking to sell a home or office. Homes and Offices that have this type of structured wiring in place are more valuable vs their competition and can give you a leg up on your competition. If you're looking for help designing an office or installing low voltage wiring please give me a call. I'll work out a quote. I've covered methods of cutting your cable bill a few times now. Methods such as bringing your own equipment to cutting TV down to just your antenna service. Unfortunately these options always were a bit more complicated to use than simply turning on your cable box and flipping channels. Many still found paying a premium for additional channels and a simpler box to be worth the premium. Unfortunately for our cable TV providers a simpler solution is now available. It's cheaper. It's easier. It's not their product. Over the last year multiple streaming TV services have appeared. Unlike Hulu and Netflix which are essentially "On Demand" services these new cable alternative streaming services actually carry the same channels as your cable provider for less. These services are delivered to streaming devices, game systems, and even smart TVs. In many cases your existing smart TV can work with these services without needing an add on device and a new remote. Just use your TV and the remote it came with. Try that with many cable providers. The channels these providers carry vary. They all offer a free trial period where you can determine if they fit your need. If not, move on to the next provider. No worries about contract termination costs or waiting for an installer. Sign up on their website, tie your device to your account, and go. That's it. Before you subscribe to a service check to see if your device supports it. With Youtube TV, Hulu, and Sling you have a pretty good chance your device of choice will work. DirectTV Now is not as popular yet. Playstation Vue is limited to Playstation devices, Android, Apple TV, and Amazon devices. They all offer "on demand" style usage of the channels they stream. Programs that aren't offered "on demand" you can set to "record" for later viewing. All done via the service requiring no local box. If you don't have a Smart HDTV or other streaming box may I recommend a Roku? It will be one device that all these services support and it has a number of additional Roku channels available. You will find so much programming at your finger tips that you won't miss your old cable TV package. Snap this box into your TV's HDMI and USB Ports and you will be off to the races. You'll need internet access from your Cable provider or AT&T. I strongly recommend 45mbps or faster especially if you're going to have two TVs or more running at the same time. This should run you about $60 a month. Then add on top your chosen service. Personally I suggest starting with Youtube TV as it gives you a long trial period as well as access to "Youtube Red" programs as well. That and most every streaming box includes a Youtube client. This will run you $35 a month. So total you'll be spending $95 a month. For comparison, how much is your cable package running you now per month? With equipment a conservative bill would be $150 a month. I've seen bills easily cresting $265 a month with equipment and add ons. If Youtube TV doesn't fit your needs. Try Sling next. Look their packages over. I'd recommend the $40 package as you can stream to more than one device at a time and it has more channels. Use the free trial to see if this fits your needs. If not move on to the next service. If none of these fits your needs even with combining in other services (for instance Youtube TV, Netflix, and various Roku free channels) then go back to your cable provider as a new customer. I strongly suspect that if you give this a chance you will find it's not only more affordable, but much easier to use. You don't need to learn a new complex remote. You'll either use the remote that you have from your TV, or you use the Roku remote. Compare these to your cable company DVR remote.